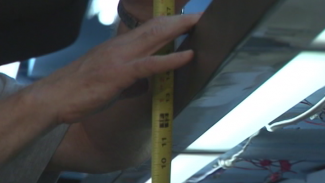 If you’re building a long backdrop for your model railroad layout, you’re going to have to connect the boards together using nails or staples, which means you’ll end up with a fairly visible seam. Expert modelers generally have a couple options during the process of model railroad backdrop construction to cover this seam, but we’ve found the most reliable one is to use drywall materials and paint to hide the connecting points and blend the two boards together. In this lesson on model railroad backdrop construction, we teach you how to use drywall tape, joint compound, a sanding sponge and paint to properly conceal seams in your backdrops. The most realistic model railroad layouts are the ones that hide all evidence of construction. In order to maintain believability and keep viewers fully captivated, you must make your scenes as seamless as possible. So when completing model railroad backdrop construction, your goal should be to leave no traces of seamwork or crafting behind. That’s why NMRA Expert Modeler Gerry Leone is here to teach you the correct way to cover and blend seams in your model railroad backdrop construction. Gerry begins the step-by-step demonstration for proper concealing and blending of seams by introducing the materials you’ll need. You can find each of these products–drywall tape, sanding sponges and joint compound–at your local hardware store, and while they’re intended for home construction, these materials are perfect for use in model railroad backdrop construction. Gerry first shows you how to cover seams in your model railroad backdrop construction with thin tape, and then seals and sands the seam with drywall mud and a sanding sponge. After your mud has been smoothly sanded and untraceable to the touch, you’ll learn the best way to blend your seam covering with the paint job that’s already been done on your model railroad backdrop construction. 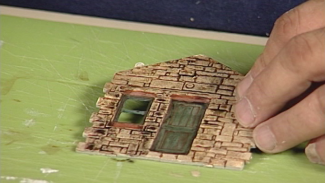 To do this, Gerry demonstrates a simple stippling method that can be completed with a cellulose sponge and small amounts of white and blue paint. Use his expert techniques for concealing seams during model railroad backdrop construction, and none will be the wiser!